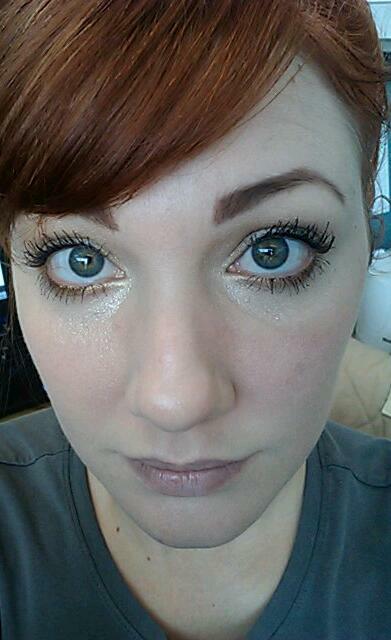 As part of my recent Ulta haul, I picked up a tube of Rimmel Extra Wow Lash Mascara. 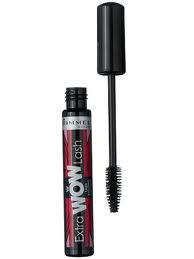 Extra WOW Lash mascara, the new volume and lash building mascara with a 50% larger brush for WOW volume. The supersized brush makes it easy to build soft to dramatic look with visible progressive volume up to 12X. Lash building formula for highly defined lashes. No clumping. Briefly, I was not impressed. The wand was a bristle version of the Glam'Eyes brush. Initially, that left me quite excited. The excitement quickly faded when I started applying the product. One coat will give you a very natural look. Which is fine... if you aren't looking for that "extra wow" the name promises. Two coats builds the look up a bit, but if you want to go beyond that (remember, we aren't in "wow" territory yet, let alone "extra wow"), be aware that clumps lie ahead. Everywhere. Oh, and it starts to get flaky tendencies with more than two coats. I usually put on 5-6 coats to get close to my "is she or isn't she wearing falsies" look that I prefer. Even then, it still isn't what I would call "extra wow", and with how many coats I had to apply, and how long it took to get it on there while avoiding clumps and stuck-together lashes... well, even the "wow" is gone. Now, for the after picture, on YOUR left is Rimmel Scandaleyes. On YOUR right is Rimmel Extra Wow Lash. Both are in the shade of Extreme Black. Scandaleyes is about 3-4 coats, and Extra Wow Lash is about 6-7 coats. I used the two different formulas so you could see that it takes more effort to get the same look with the Extra Wow Lash as it does with the Scandaleyes. I'm not disappointed enough to throw the tube in the trash, but it is going to be tossed in the drawer of makeup I keep on hand for emergencies. It just takes too much time and effort to get it to look as dramatic as I like.